One week and some odd days of "life on the inside", as I've affectionately started referring to our hospital stay. Last Friday marked one whole week down. Boom. Done. Sure, hospital life is fairly monotonous and intrusive. I'll give you that. But, I can honestly go so far as to say these past ten days have gone really fast and been relatively enjoyable. I'm not about to put on the front that everything is sunshine and rainbows. This is a hospital, for goodness sakes. Believe me, there are low moments. Yet, there is an incredibly reassuring feeling about knowing you and your baby are in the safest place possible with immediate access to top medical care. An overwhelmingly reassuring feeling. The first weekend involved a flurry of activity as Benji and I were admitted. Lots of visits from the doctors on my perinatologist team, as well as their fellows and residents as they all got to know us. We also received a visit from a neonatologist, standard with every admit, who spent a great deal of time educating us on premature babies at all stages. He was very positive about the prognosis of a baby born at 35 weeks. Incredibly positive. Chances are high that our Benji will only have to spend mere hours in the NICU. This is certainly our hope and prayer. The bump gets "incarcerated" at 28 weeks. I didn't know it was possible, seeing as I was raised in a family of nurses, but my appreciation for nurses has already increased ten-fold. This nursing staff is the sh*t. Excuse my language. They are the glue that holds this place together. Day in and day out these nurses see the full spectrum of different high risk pregnancies, expectant moms and dads in incredibly vulnerable states, and the most fragile of unborn babies. The level of compassion and genuine caring they have already shown my family is admirable. We are unabashedly loving on them with pizza, toddler charm courtesy of Isaiah, and gigantic Wenatchee-grown Stemilt apples (hollaaa!). 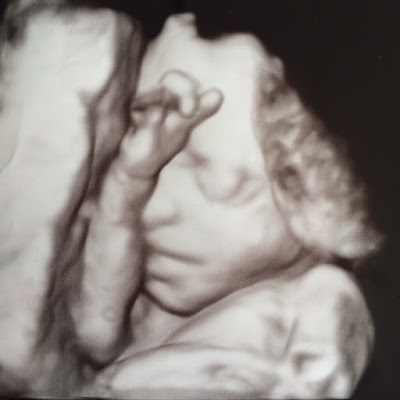 Ultrasounds will most likely happen weekly at this point. I had an ultrasound the very first day I was admitted and again just this past Friday. Both showed very little, if anything, has changed with my Vasa Previa since the condition was first detected. My weirdo placenta is still weird and the ongoing talk of the department... "Oh, so you're the one with that placenta!" Yes, thank you, that's me. 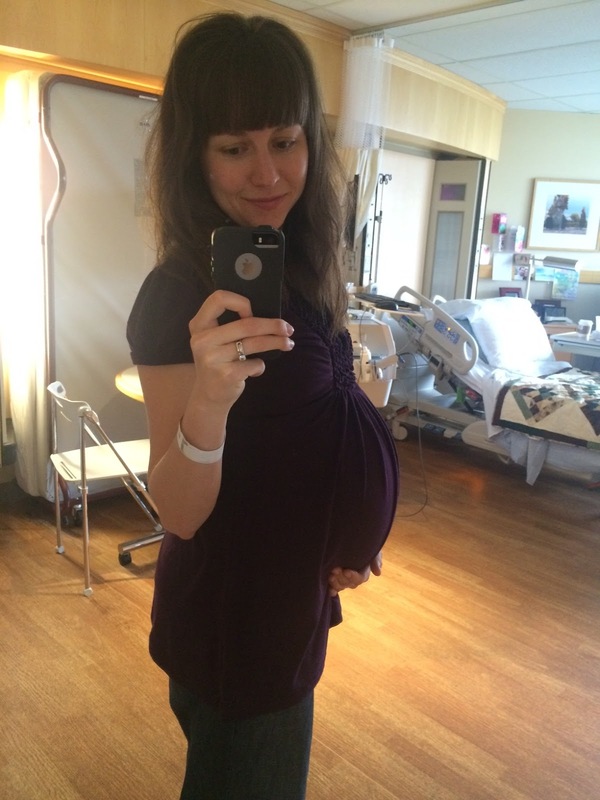 The lady with the placenta that poses a very real threat to her child, yet is simultaneously keeping him alive. Oh the irony. Very reminiscent of my pregnancy with his older brother, Benji is already measuring 3+ pounds at this point in the game. Jason and I only know how to make 'em one way: BIG boys. 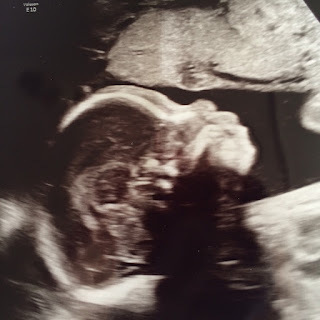 Long story short, our baby is very healthy and we are simply playing a waiting game to bring him earth-side. Upon our admit to the hospital, I received my first round of steroid injections. This will help to speed up Benji's lung development in preparation for when they take him at about 35 weeks. These steroid injections will happen every two weeks until delivery and involve a nice shot in the, ahem, bum. The countdown is on for my next round of steroids this coming Friday. You can pray for me about that at the end of the week. The side effects of the 'roids are NOT fun. Cute profile! I see a Jason & Isaiah nose. These past ten days have included daily visitors. Bless your souls for sitting with me, feeding me, laughing with me, praying over me, and taking me on walks. Each day includes twice daily fetal monitoring. Every morning and every evening. A simple routine I love; being still and listening to my son's strong heartbeat. Last Wednesday I attended a support group for expectant moms in my department. There were four moms in attendance, including myself, and every one of us is here for the long haul. Not one of our high risk pregnancies is alike. Sitting and listening to these women pour out their hearts and share the stories of their unborn children and explain what's brought them to Swedish was incredibly humbling and perspective shifting. Some of these women still do not even know if their babies are going to make it. Throat punch. But, they are here. Teaming with the best maternal and fetal specialists. Fighting like hell for a child they have yet to look in the eyes. And that, my friends, is when I lose it. A mother's love knows no bounds. 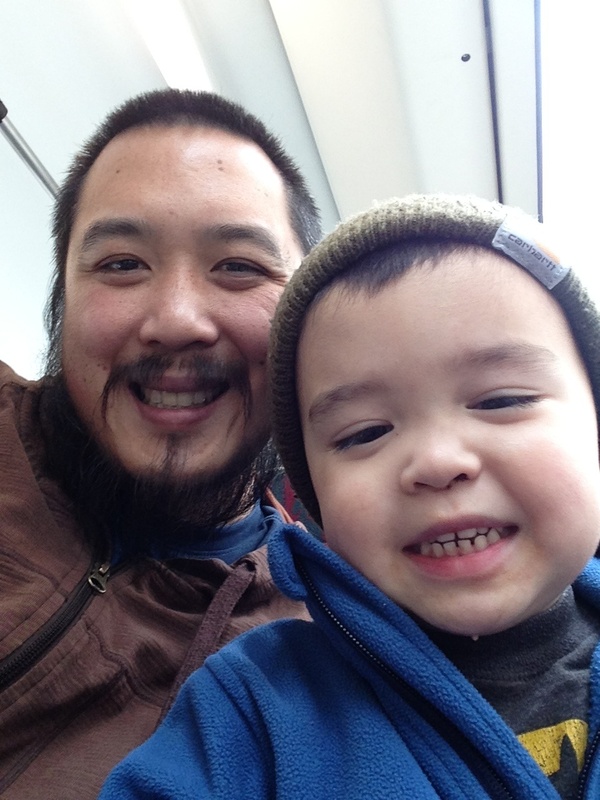 Riding the Capitol Hill Streetcar! Thank you to each and every one of you who has loved on Jason, Isaiah, Benji, and I from near and far. Please be assured that every prayer and well-wish has been felt. Thank you for the cards and drawings that dot the walls of my room. Yes, I taped up every single one. Thank you for the thoughtful care packages sent from all over the land. Thank you for the ongoing meal support for my guys back home. We are all so grateful for your help in this very tangible way. I never expected so much GOOD to come out of a situation that, at one time, seemed so scary and overwhelming to us. Finally, if you feel so inclined, here is a list of specific things you can pray with us about: strength and cohesion for Jason and I as we try to operate jointly, but apart; my momma heart as I miss Isaiah something fierce; my cravings for fresh Ellensburg air and the longing to witness Spring's unfolding in person; for Benji to continue impressing the doctors and being a stud; for my placenta to continue its string of good behavior, and; my next round of steroid injections happening this coming Friday and Saturday. I run, travel, photograph, write, read, cook, bake, study, pray, hike, camp, snowshoe, ski, craft, sew, decorate, thrift, clean, organize, reflect, love, think, grow, seek, and live. In no particular order of course. Oh, and occasionally I'll blog.